Ever since I became a phone reviewer, my messages have been a mess. When I switch from an iPhone to an Android one, I need to remember to turn off iMessage on all of my devices lest I miss a blue bubble that sneaks through. And any conversations I was having on my iPhone are effectively over when I switch, since nothing carries over between operating systems. It’s not much better when switching between Android phones. Android Messages doesn’t sync or restore your texts between phones, no one uses Allo, and third-party apps can be wonky. I’ve taken to using Pulse to keep my conversations synced across numerous phones and devices, but I still need to be careful when I switch SIMs since it’s not technically designed for multiple handsets. On more than one occasion, I’ve blown up my conversation history and needed to start over. But now Google is working on a new solution. Following Allo, Hangouts, Voice, Messenger, Groups and Talk (am I forgetting any? ), Google is poised to rollout a new messaging protocol to Android called "chat" (with a lowercase "C" since it's a protocol, not a client). According to The Verge’s exclusive report, chat won’t be a standalone app but rather a part of Android Messages that finally bring modern texting features to Android’s stock messaging app, such as typing indicators (those dots that let you know someone is responding), read receipts (that switch that everyone turns off), quick replies, proper group texts, and, most importantly, full-resolution pictures and videos. 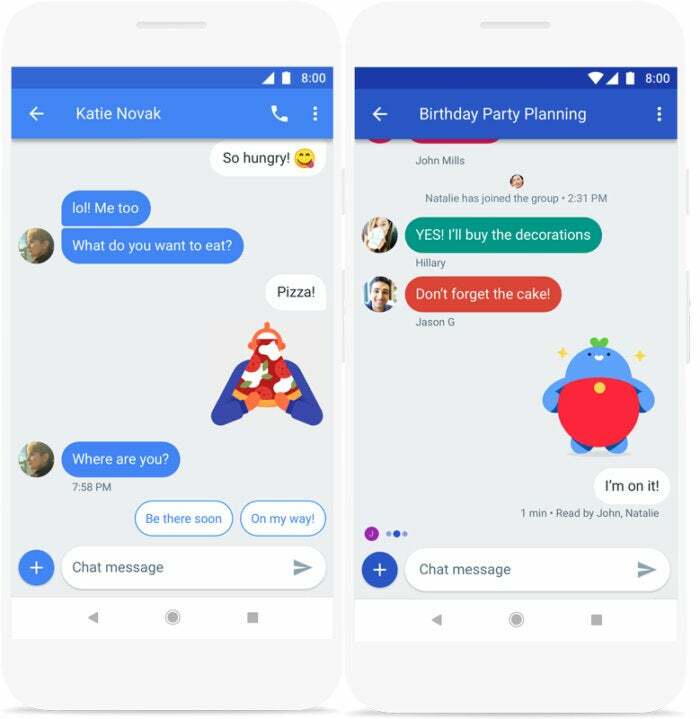 Android’s new chat will bring features such as quick replies (left) and proper group chatting (right). To say this is long overdue is a massive understatement. While iPhone and Whatapp users have enjoyed these fundamental features for years, Google has been slow to roll them out, due in no small part to its numerous carriers and manufacturers. To be successful, Google needs to get everyone on board, and that’s no small task. But according to The Verge, Google has full support from 55 carriers and 11 phone makers. Even Samsung. Google has already begun rolling out RCS internationally, but it could take a while before everyone's on board. And it won’t be as good as iMessage. But for the first time in a while, there’s hope that the messaging mess on Android will be fixed. 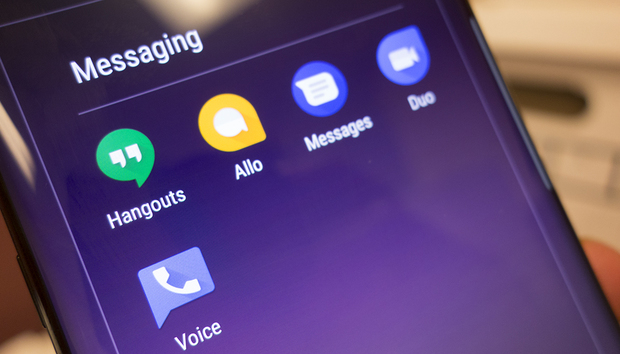 Every Android phone (including Samsung’s Galaxies) will have Android Messages as the default messaging app with chat turned on. Every carrier will flip their RCS switch on the same day so all Android users enjoy the same experience. There will be an Android Message app with chat support for download in Apple’s App Store. Google Assistant will be integrated like Allo. Stickers, search, and GIF support will come soon. Back-ups will be done automatically each night to your Google Account and restored when you sign into a new phone. Carriers slowly sign on to chat, with at least one of the big four dragging its feet for the better part of a year. Apple won’t support chat on iPhones. Google Assistant will be integrated within the first year. Stickers and search will come slowly, GIFs even slower. Back-ups will be limited to the Pixel phones and still won’t restore media. In reality, chat will fall somewhere in the middle, and I’m kind of OK with that. I mean, at least it won’t be worse than what we have now, and it gives Google a foundation to work with. As it stands, there’s no unifying vision to tie everything together on Android. Even if you just want simple SMS, your Android phone pales in comparison to an iPhone. Chat won’t bring Android Messages up to the level of iOS, but it will make it a lot better. Heck, there’s even a web interface in the works. Like Android Messages, Chat won’t be a Google service, in that messages will be funneled through carriers’ servers, not Google’s. That’s a big distinction over Apple’s service, and it won’t be as easy to add new features like Google Pay support and selfie stickers. But the biggest detriment to RCS is exception. The new Chat will have a web interface so you can chat on a laptop or Chromebook. Where Apple’s Messages and apps such as Signal and Telegram (and Allo’s incognito mode) feature end-to-end encryption for text messages, chat will not. It would be nice if it did, of course, but that shouldn’t be a deal-breaker for most people, since SMS isn’t encrypted either. Anyone who values privacy on Android is likely already using a secure messaging app, and those won’t be going away. But for the rest of us, chat is the best start to a proper modern messaging service we’ve ever gotten on Android. In a way, it feels like Google’s last chance to get it right, and from what I see here, it’s finally doing it the right way, with a universal method rather than a proprietary one. For it to work, Google will need to stay focused and not stall development like it did with Hangouts, Allo, Voice, and every other messaging service it’s launched. It’ll need to lean on carriers and OEMs to build in support. And it will need to woo Apple to allow a chat app in their App Store. Google has tied and failed numerous times to get messaging right. Chat might be the answer. That won’t be easy, and Google’s track record with messaging apps isn’t great. But for the first time, the vision is right. When Allo tried to fix Android messaging, the core concept was flawed. Any new service, even a Google one, will require a massive commitment by users to be successful, and unless it’s the default app on every phone, that’s not going to happen. With chat, Google isn’t trying to build a new service from the ground up. It’s leveraging the existing foundation of Android Messages and adding a modern layer, with the promise that it’s just the start of something new and better. And I couldn’t be more on board.